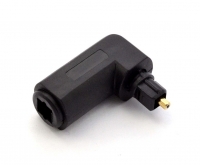 This Right-Angled TOSLINK Optical Adapter is essential for adapting your TOSLINK sockets for use in tight spaces. Ideal for wall mounted TV's with limited space between the TV and wall. TOSLINK and other Optical data conduits are easily discounted as pure magic, but they're just as reliant on the quality of the cables as any other medium – if not more so! A dodgy connector can seriously reduce the quality of your sound, and the only way to cut out those weak links is to invest in proper, high-quality connectors. And as luck would have it, they're the only sort you'll find on my site! This Right-Angled TOSLINK Digital Optical Adaptor is just the ticket for making the best of tight spaces, where you might not have enough room for a TOSLINK Cable to patrude out. Maybe there is a little bit of magic in there after all! Answer: "This adapter is 20mm deep when plugged into a standard TOSLINK socket." Answer: "Yes, it has a full 360 degree swivel on the short side."